It's Day #10 of 27 Days of Thankful. Click the link to find out what's going on here every day in November until Thanksgiving Day. I wait all year long for the season to be right to make some pumpkin bread. It just doesn't feel right to bake up a batch of Autumn deliciousness when it's 95 degrees outside. We're finally experiencing some Fall weather here in Virginia, and I couldn't resist baking last night. T was pleasantly surprised when he came home from work, and I thought I'd share the recipe with you today. I've had it so long now that I'm not sure where I first found it, but it's too easy and delicious to not share with my blogging friends. Divide batter into two loaf pans. Bake at 350 degrees F for 55 to 60 minutes, or until toothpick inserted in center of loaf comes out clean. You could also add chocolate chips, or make a cream cheese icing to drizzle on top. So many variations! I enjoyed mine last night with a mug of the mocha mix stuff. Yum to the bread, yuck to the mocha mix. Bon Appetit! 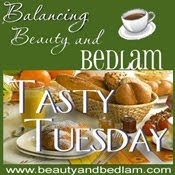 Check out Jen's Tasty Tuesday party for more great recipes. Today, I am thankful for delicious Fall recipes that bring a smile to my family's face. If you link up, please be aware that this is a party for bloggers to list what they are thankful for. I had a blogger link up some craft projects yesterday, which is fine if that's what she's thankful for, but her post didn't really mention that part. Thanks for playing nice, guys! Please include a link to this post if you link up! Oh thanks for the recipe, I;ve got pumpkin in the fridge that needs to be used up right now! Missed the baking of acorns part of your post. I'll have to try that next time! Ohmygosh! It's like you read my mind. After my blog stalking I was going to search for a pumpkin bread recipe to make as a thank you for a dear friend. Awesome! This looks so yummy, I can't wait to try it. Mmmm... Your recipe looks like a good one. I sure would like to have a piece now to go with the coffee that I'm drinking. That pumpkin bread recipe looks yummmmy!!!! Sorry to take so long to leave a comment! This recipe looks delish! I LOVE me some pumpkin stuff...I will totally add chocolate chips AND cream cheese icing! MMMMMM!